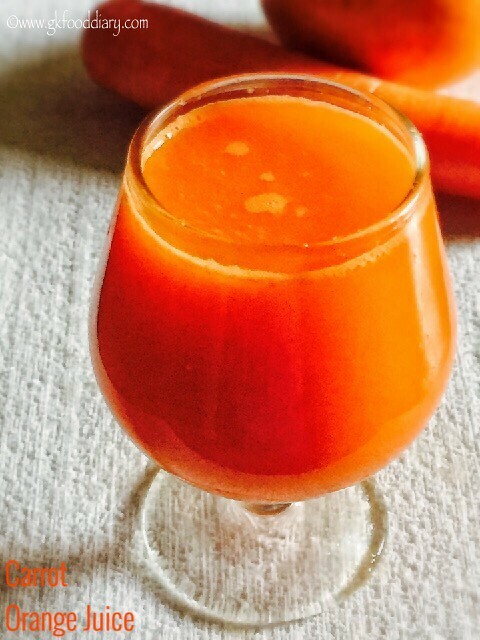 Carrot Orange juice – healthy vegetable fruit juice with carrots and oranges. I prefer homemade juices to beat the heat during summer than the juice we buy at store. 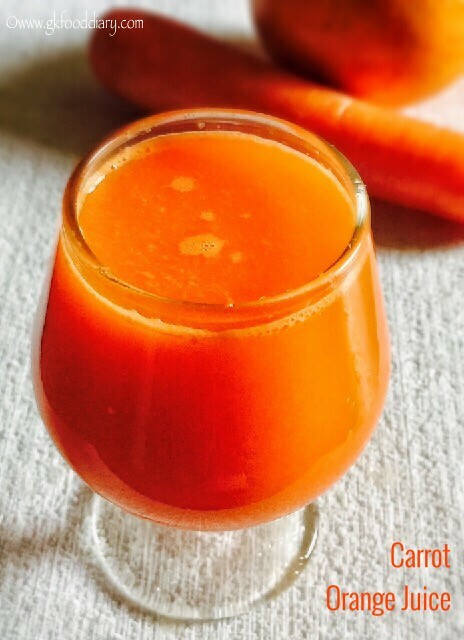 Carrots with a dash of oranges makes it all more healthy and tasty. 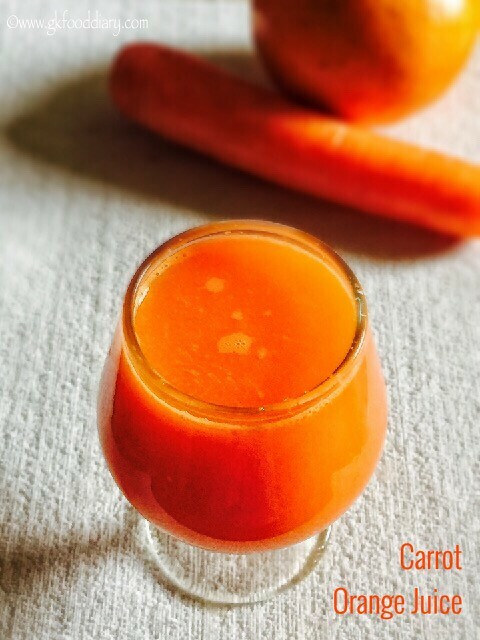 For small babies raw carrots are not easily digestible and hence I would suggest to give this fresh carrot orange juice to babies after one year (start with a small amount). 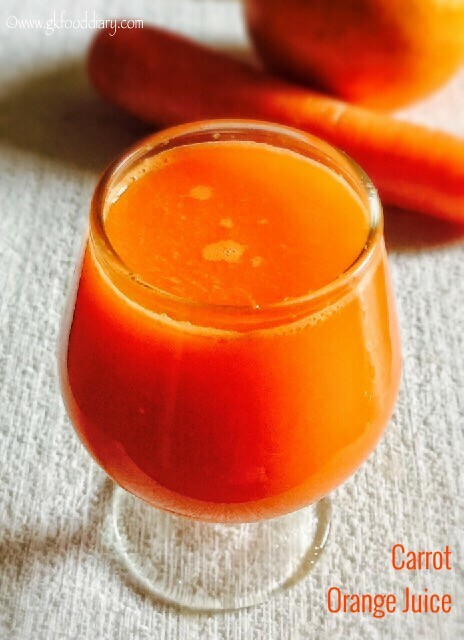 Here is how to make fresh carrot orange juice recipe for babies, toddlers and kids. Keep all the ingredients ready. Wash carrots well. Peel the outer skin of carrots using a peeler. Then cut the carrots into slices, puree the sliced carrots along with ginger in a blender. Use little water while grinding. Set aside. Wash the oranges in running water thoroughly. Cut them into half horizontally. Squeeze each half of orange by your hand using a orange juicer. Collect the juice in a bowl attachment comes with a citrus juicer. Filter the Orange juice and keep it ready. 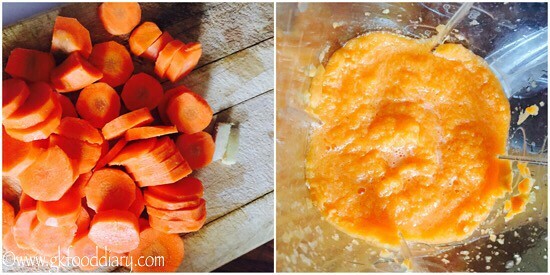 Now Filter the carrot puree using a strainer and add remaining water, Orange juice, honey & mix well. 1. Keep all the ingredients ready. Wash carrots well. Peel the outer skin of carrots using a peeler. 2. Then cut the carrots into slices, puree the sliced carrots along with ginger in a blender. Use little water while grinding. Set aside. 3. Wash the oranges in running water thoroughly. Cut them into half horizontally. 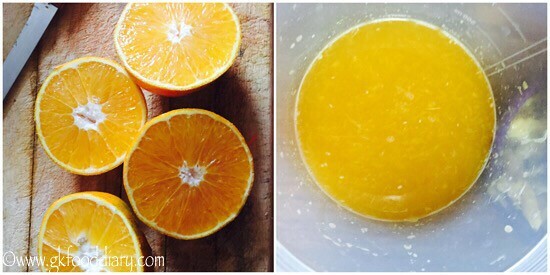 Squeeze each half of orange by your hand using a orange juicer. Collect the juice in a bowl attachment comes with a citrus juicer. Filter the Orange juice and keep it ready. 4. 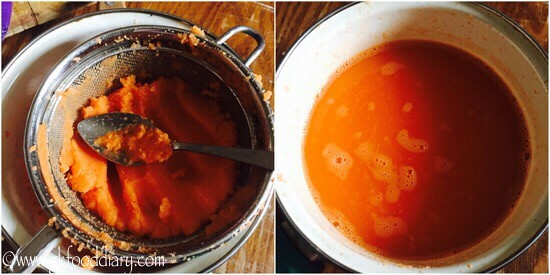 Now Filter the carrot puree using a strainer and add remaining water, Orange juice, honey & mix well. Fresh carrot orange juice is ready! 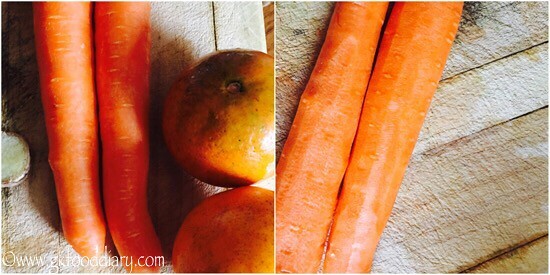 Adding ginger helps in digestion, as raw carrot is not easily digestible for some babies. If the oranges and carrots are sweet enough, skip adding honey.Adjust sweetener as per your preference. 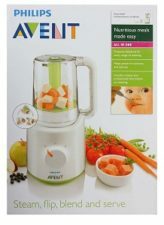 Give only a small amount when you introduce this juice to your child. Also it’s recommended to dilute the juice with water when you introduce.